United by the aim to preserve territories and resources, humanity should respond as community to the problem of rising aridity. Some companies have dedicated years of scientific research on working out how to govern the climate. In early 2000, finally, their work concluded with positive results in the matter of controlling the climate. In their experiments, scientist used various methods to control rainfall, one of the oldest basing on chemtrails spread by airplanes, before turning to a solution with “apparently” less impact on the global system: ionization. Few companies are touting their ability to create rain from clouds that would normally produce none. To make this process, still barely understood by the scientific community, become proven science, ionization devices are being field-tested around the globe. Most people are unaware that weather modification by cloud seeding has gone on for years, and even less are aware of this new technology. Based on the ILAP Technology (Influence on the Local Atmospheric Processes), Clear Sky Manager TM has been developed by Advanced Synoptic Technologies Ltd (AST) for managing, at a local atmospheric level, humidity density in the sky in order to pursue a a wide range of possible objectives: create precipitation, avoid or create snow, disperse fog and smog or, generally speaking, conduct any type of atmospheric action that may improve living conditions at ground level. Most of these studies are only at the theoretical level, the evidence of the operation are uncertain, the research continues. Clearly there is a serious danger related to the possibility of making military use of climate control, which is why many researches are secret. I sincerely hope that the use of such powerful technologies will be to the benefit of all humanity and not turn against it. Breeding clouds is a vision of a possible future in which mankind has managed to use its wits to solve serious problems such as climate change and aridity. 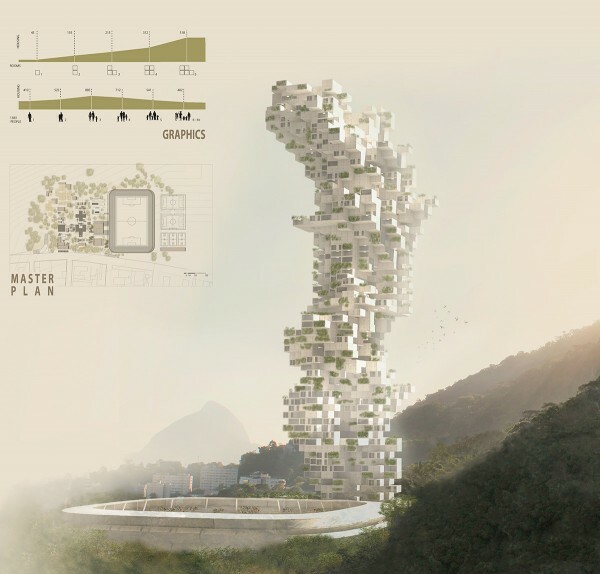 To interpret vertical building in a world in danger means to create small vertical ecosystems. The Breeding Clouds towers are rain generators. 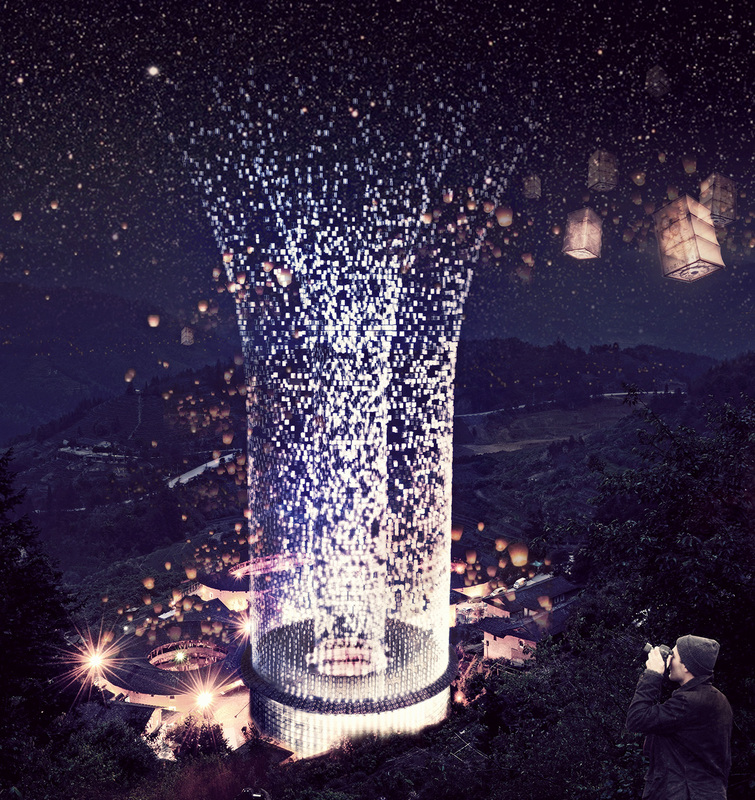 The lower part of the tower consists of ionizers that collect and electrify dust particles from the ground. Negatively charged ions tend to rise to the warmer air. 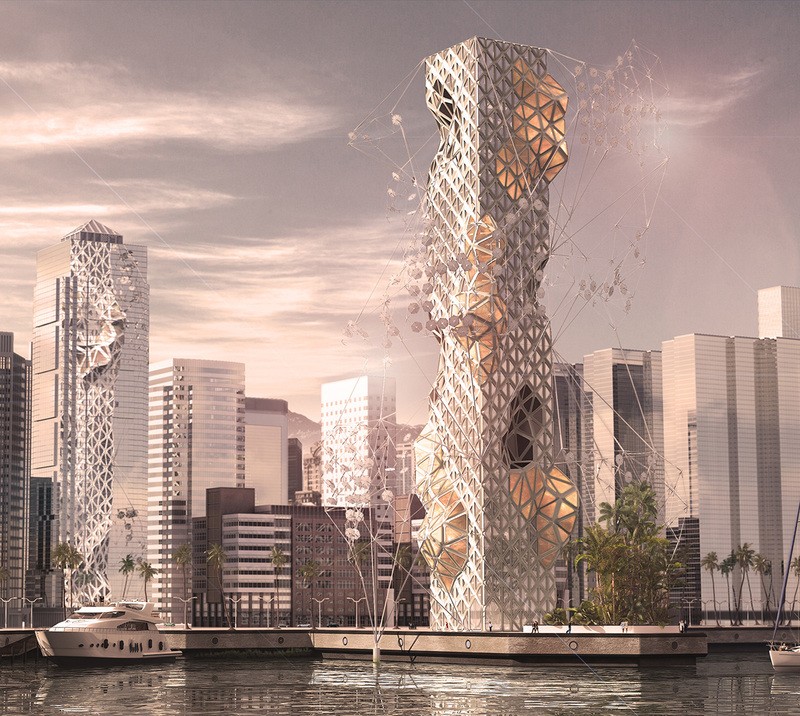 Each tower has the ability to capture within a giant glass case the ionized particles. Inside the condensation chamber they are kept in continuous circular motion in order to condense the charged particles with the right humidity: in this way a cloud is generated. 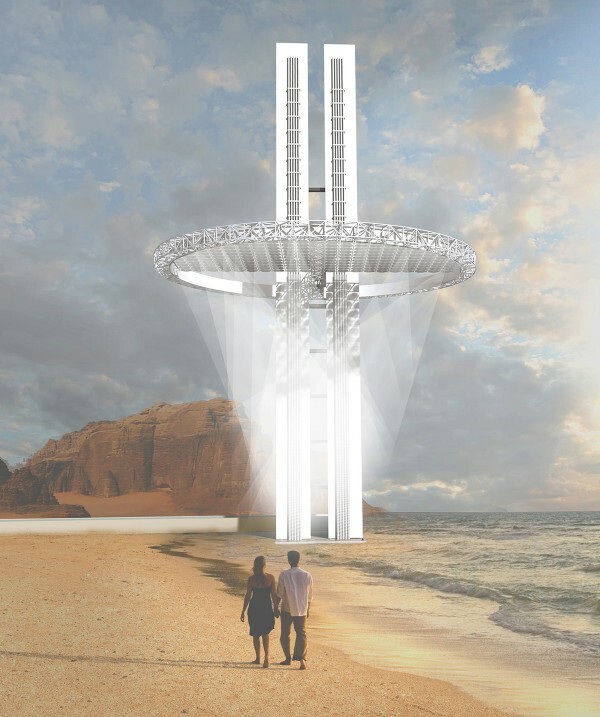 The fully charged cloud will create rain, which is collected along the stem of the tower and will be used to irrigate the levels of the tower and the surrounding soil. Large amounts of rain concentrated in a small point may change the way to cultivate plants. The tower is a large vertical greenhouse to collect botanical species that usually could not exist in an arid climate. Developing these towers in desert areas means generating artificial oases. The power supply of this futuristic building is autonomous, using the kinetic energy of the water itself and solar energy captured on the outer shell of the cloud generating condensation-chamber. According to the complicated politic statues, the communication between people in Taiwan and main land may have some difficulties, however, which situation would also exists all over the world in fact. How to stitch such kind of politic cut in the way of culture? Our solution is to arouse the common cultural icon to cross the gap. 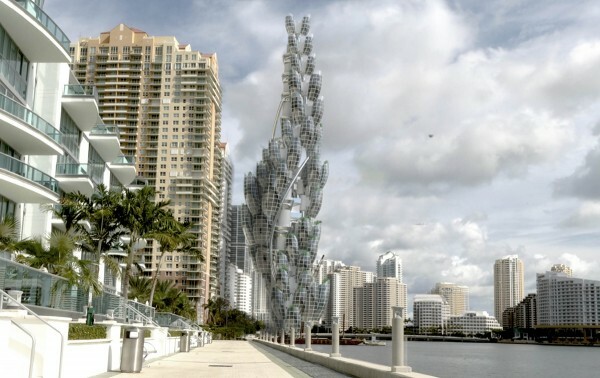 We finds a new way – the aggregation and segregation of thousands of small units – to definite the composition of the skyscraper as out concrete expression. The statistics tells us that more than 70 percent of Taiwanese are from the region of Southern Fujian, most of who migrated to Taiwan during the period of Dutch colonial possessions. There goes a Chinese traditional saying—the falling leaves will always return to roots. We hope their wish and blessing would pass over the Formosa Strait from Taiwan to their hometown Fujian, their hometown, by the help of the new “Sky lantern”—a device designed to express wishes in a traditional way. The sky lanterns in China represent a kind of blessing in traditional culture, which hold the simple wish from ordinary people when rising slowly up to the sky after ignited. However, with the development of technology, we begin to lose the traditional way of living, and this kind of symbol is being gradually forgotten during the new ages. We want to revitalize this tradition, in order to arouse the sense of the cultural self-identity across the strait. The sky lantern, which holds the best wishes from the Taiwan people, flies slowing across the strait to the Tulou( a traditional building based in the kinship in Fujian) by the navigation of GPS inside and the power of the flight system of the quadrotor aircraft. The projector in the central columnar will cast the personal image and video to the surrounding screen skin. With the rapid urbanization and the migration of population from rural to urban, some Tulou have been discarded because of the lack of public space. Our lanterns will gather around the discarded and damaged Tulou, whose new translucent skin will combine the lantern into a new light form. It will not only provide a new public space for the locals but also revitalize the traditional building which is on the verge of fading away. The Oculus is a vertical community. It is a place to live, work, and commune with nature. The building exemplifies a new urban high-rise typology where one can experience the human condition as it is meant to be, full of life. 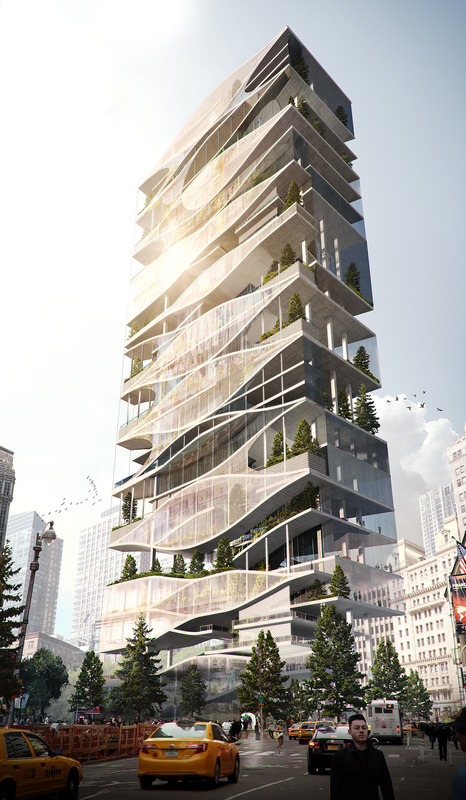 The purpose of this skyscraper is to cultivate a sense of community through its mixed-use program (public, private, collective, and civic), and to promote a self-sustained environment through the building’s digital weather system and form. The Oculus’ site was chosen in Lower Manhattan– at the intersection of Water Street, Pearl, and Beekman– wedged between corporate downtown and the industrial South Street Seaport. The challenge of building on a “no air rights zone” ultimately lead the project to embrace its existing irregular shape, a triangular parcel that is surrounded by two intersections and a pedestrian walk-way. The building’s concept was derived from its triangular footprint, and as a result, the unique form of the building evoked a new spiritual identity for the metropolitan community. 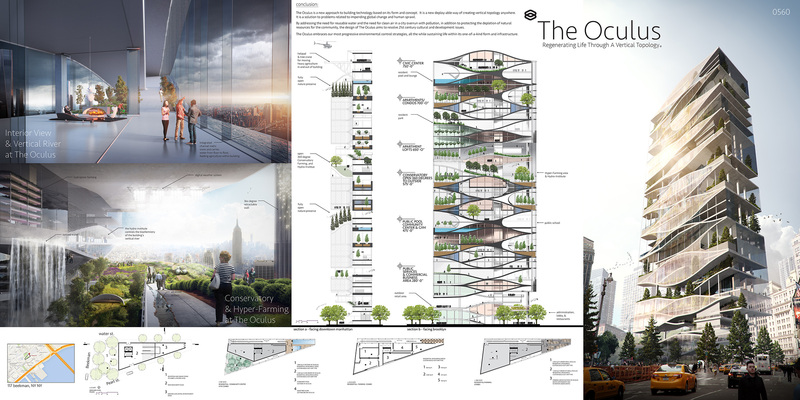 The Oculus is a flexible and adaptable apparatus, which collects, develops, and sustains natural resources for the benefit of its inhabitants and surrounding society. 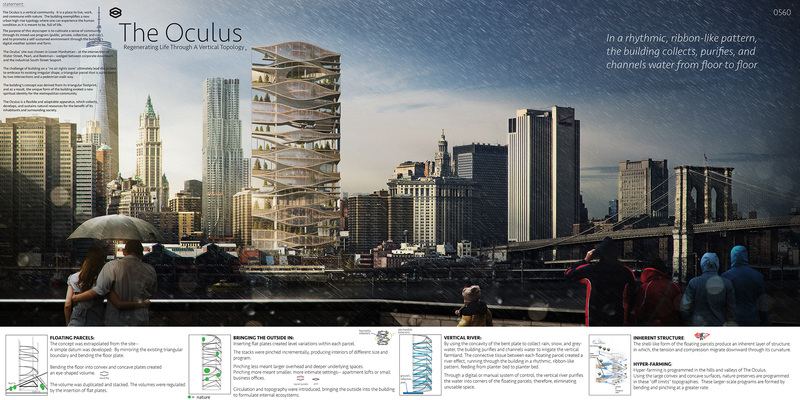 The Oculus is a new approach to building technology based on its form and concept. It is a new deploy-able way of creating vertical topology anywhere. 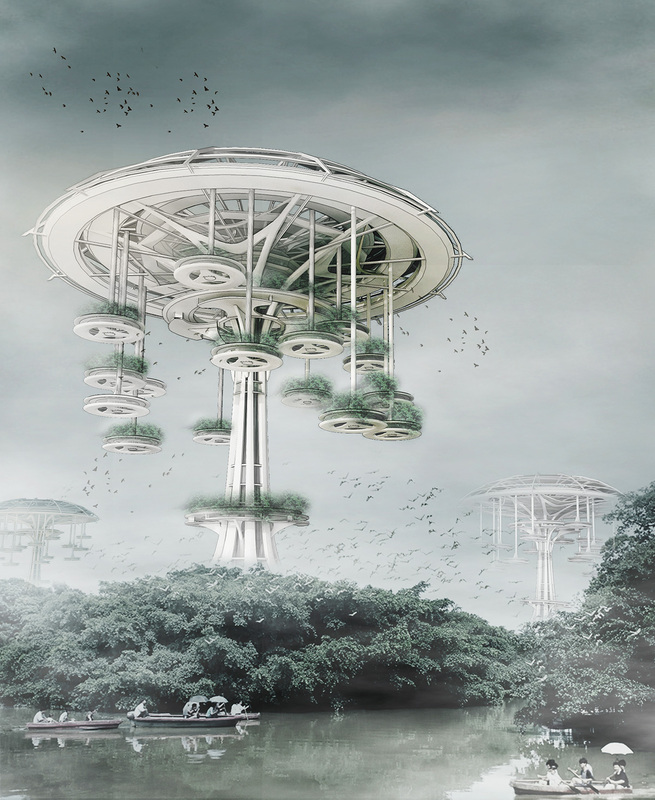 It is a solution to problems related to impending global change and human sprawl. By addressing the need for reusable water and the need for clean air in a city overrun with pollution, in addition to protecting the depletion of natural resources for the community, the design of The Oculus aims to resolve 21st century cultural and development issues. The Oculus embraces our most progressive environmental control strategies, all the while sustaining life within its one-of-a-kind form and infrastructure. A xerophyte is a type of plant that has evolved over time to adapt to the dry conditions in a desert. The adaptation or evolution of a xerophyte is to store significant amounts of water to allow the plant to survive over long periods without water. Building design and construction has developed create fixed objects that serve a function over time. This approach is in line with human-kinds basic needs for shelter and stability but the result are products that have a limited to ability change without significant expense. This design approach has been adequate for the majority of human history as the rate of change for the way we live has been nearly in line with the products of our architecture. The past several decades we have seen an extreme acceleration and change in the ways we work play and communicate and our approach to design of the places we build has also evolved with the way we live. With the pace of technological change and the effect on the built environment the design is bringing the old new together to produce a creative solution and balance between technology and nature. the building is defined by its ability to change, a philosophy that seeks to create spaces which can evolve and change with the needs of its inhabitants and the constraints and challenges imposed by its surroundings. 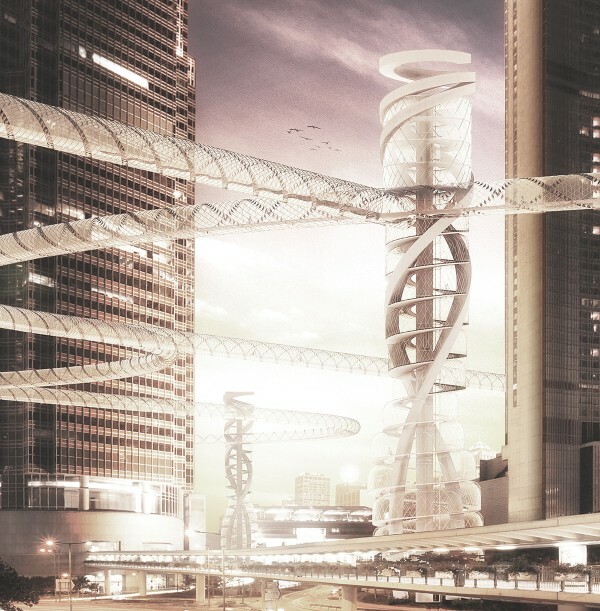 The Xerophyte Tower uses conventional high reside technologies coupled with some of the latest advances in materials and science. The backbone of the will be a central core used as the anchoring point and primary structure. The tower utilises conventional high rise technology coupled with advances in material science and. The backbone of the tower will be a central core that is used for the primary structure. This central spine will service to provide a portion of the vertical movement and servicing for the tower. Orbiting the perimeter of the core will be secondary structures which are envisioned to be completely modular secondary units. Constructed completely off-site in factories with the use of renewable resource’s such as forested timber. Gulao waterfront village as the last ecological area which has traditional characteristics in Pearl River Delta of China has another reputation named “Southern Venice”. With the development of population of the local villagers, Gulao waterfront village is facing a severe challenge between its expansion and the scarcity of land resource. It has abundant water resources in Southern China, and most of the villages are built near water. The settlement architecture in Gulao waterfront village are one unique as dots that are scattered across the whole village, which accounted for expansion limited. It is essential for us to help the last traditional waterfront village in Southern China in the role of designers as an attempt to solve the problem. Therefore, a skyscraper is designed as “Floating Waterfront Village”, capable of sustainable development. In ancient times, waterfront villages in Southern China are located in low-lying areas, which is accounting for flood disasters, a serious threat to villagers’ life and productive activities. The local people dug deep ponds for breeding fish in some low-lying areas, according to local condition. The whole village was constructed of mulberry-dike-fishponds avoiding the depression of flood and creating ecological environment. Some villages were constructed on the piers, spreading across the waterfront area. Pier as land is linked to pond-protecting wall. Buildings are constructed on the piers as little as one household to as much as twenty households and also ancestral halls are constructed on them. Ponds separate different piers, thereby forming punctuate villages. “Floating Waterfront Village” as a new kind of skyscrapers will be introduced to Gulao waterfront village, making the best use of original land of the village, by not destroying its skin texture. The height of skyscraper is more than 300 meters; it looks like a floating waterfront village or a bird paradise in the air from the ground. From the morphological point of view, the design inspiration is from the traditional big Banyan in Southern China, and mainly living and activity function are put on the small and large platforms. There are some small living platforms hung down around the top roof as “aerial roots”, which makes the skyscraper integrated into the whole environment. “Floating Waterfront Village” not only has practical function, but also set complex ecological energy saving, scenery viewing, science educating and art in one of the multiple experience. By the way, it establishes a showcase of waterfront village of green ecological and low carbon energy saving technology in the future. “Floating Waterfront Village” has multiple identities. It is a village with living function in the air, also a climate observation station, or an agricultural research station, or a sightseeing platform. First of all, this skyscraper is a village for people’s living activities. Forming a waterfront village in Southern China is including lakes, ponds, wells, squares and the Banyan trees. Therefore, a huge platform is on the top of this skyscraper as the functions of activity and communication. Vertical supporting-skeleton is the water delivery system like a huge well; the water is taken out from the ponds to living areas. At the same time, different kinds of roofs have rainwater collection systems, replenishing water into ponds during the drought seasons. There are many Banyan trees planted on the platforms of the building, and the trees will be a certain scale after 3-5 years in Southern China, looking like a bird paradise. Secondly, the waterfront village belongs to the natural ecological zones, and a Banyan tree will be with luxuriant foliage covering 1 square meters, thousands of birds will be here. The climate observation station will be set in the skyscraper, also for the protection of the natural environment and rare species. Thirdly, there is an agricultural research station here to provide research and guidance the sustainable development of the waterfront village. Finally, the traditional village as an ecological area attracts thousands of visitors. The skyscraper not only releases such pressure, but also brings some economic income. For centuries we have designed our buildings aligned to the sun. We aim to inverse this premise, by aligning the rays of the sun to our buildings. With the advent of new technologies we believe the sun has the potential to play an even larger role in society than it does today, or has ever done before. Humanity has worshiped it, evolved with it, and organized its life around it. Our project aims to augment the utilization of sun’s energy on an architectural scale whereby the focus on capturing the sun’s energy goes beyond the mere application of photovoltaic cells upon surfaces. With this in mind, our design incorporates two available and proven processes of harvesting energy from the sun. Both of these processes operate by way of redirecting and thereby concentrating the rays of the sun towards a specific target but differ significantly in their output. The first of our integrated concepts is Concentrated Solar Power (fig. 1). This is a system by which heliostats redirect and concentrate a large amount of thermal energy upon a small area which is transferred to a viscous substance which is in turn used to drive a steam turbine. The second incorporated concept of energy harvesting is commonly referred to as Solar Thermal Cooling (fig. 2). It operates on a similar principle of focusing solar rays but alternatively uses the accumulated heat to fuel an absorption chiller, a device that transforms a hot substance into a cold one, which in turn may be used to cool the interior space of the building. As previously indicated, both strategies utilize a methodology that operates on the principle of Forward Ray Tracing (fig. 3). Accordingly, arrays of heliostats are optimally positioned around the tower which redirect the sun’s rays as the earth completes its daily rotation. The tower’s deformed surfaces demarcate areas where Concentrated Solar Power and Solar Thermal Cooling are employed and are convex and concave respectively in accordance with the spatial requirements of the two technologies. The subway provides convenience to commuter during commute time as a transportation that is used by many people. However, because of high-rise buildings and city concentrated of population in the main cities even the convenient subway became uncomfortable in the time when many people use. We will rise the linear of the subway which connects essential area of city and the countryside into a upper part. It is because bicycle is the transportation which can be used during rush-hour rather than car or subway that has traffic jam and inconvenience. The Bicycle is an eco-friendly transportation that lessen carbon dioxide and also make people healthy. The government made ground drive way or bicycle road to give bicycle riders convenience but it is not really efficient in reality. The bicycle road is broken because of ground road system and the accident is increasing since the number of user in intersection of pedestrian and drive way. So we planned to make a bicycle road which connects vertical station of bicycle in the empty space above subway entrance. The People of the City have too long been subjected to the free plan: FAR, $PSF, the corridor, and, by extension, the vertical instrumentality of the service core—the tropes of modernism must be questioned, for they are rich with opportunity. We declare war on the open planes of Modernism. We have bodies, we take up space. We do not need floor space; we need volume. We do not need free plans; we need free sections. Rising real estate costs and geographic as well as political barriers to city growth have put vertical pressure on the City. We can no longer tolerate a sub-urban attitude towards space—in our periphery or in our metropolis. The spatial strategy of the suburban ranch house becomes a shoebox in the gleaming high rise. We suggest an equivalent to the townhouse – a typology that has long defined the healthy Urban center. 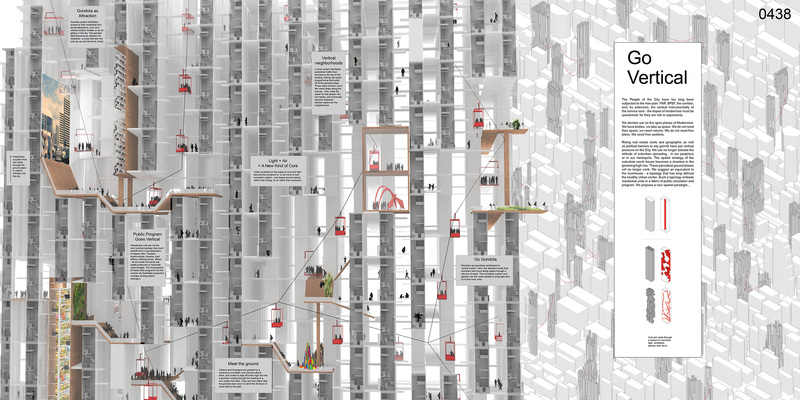 Such a typology embeds residential units in a fabric of public circulation and program. 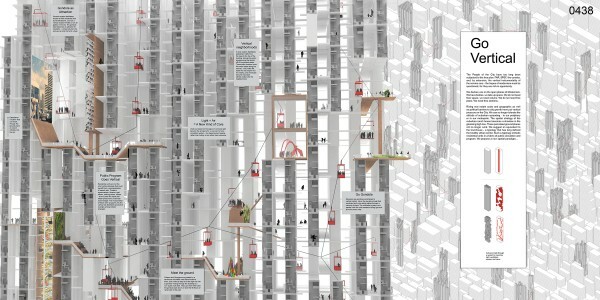 We propose a new spatial paradigm: A City designed for volume. Along with this new paradigm come attitudes of inclusion and hybridity. We recognize the layered nature of identity in the global city, in which we are all both citizens and strangers. This age-old attribute of the cosmopolitan center has been redefined in the contemporary global city by the unyielding forces of capitalism. The real estate and tourism industries vie for territory at the expense of the public. The resultant architecture reinforces the opposition between these two identities and has yet to address growing trends that contradict distinctions between resident and tourist, permanence and transience, familiar and alien. Favelas, slums, hoovervilles or bidonvilles are informal settlements that lack property rights and provide below-average quality housing in agglomerations; they tend to lack basic infrastructure, urban services, social facilities and green areas. They are located in geographic areas with dangerous surroundings and / or extreme environments. The existence of favelas has been known since the end of the XIX century; however, it was not until 1930 that they became an important part of the urbanization process in Brazil. Between 1941 and 1943, the country´s population grew significantly and the government did not know how to control this growth, they tried to develop various projects with urban purposes, but these never gave any results. Steep streets, substandard housing, darkness, marginality, violence, insecurity, bad quality of life, disease, risk of being affected by natural disasters of all types and social and economic exclusion make its inhabitants seem like products creatures of the underworld. Overpopulation and exponential growth have created the perfect conditions to turn favelas into colonies of crime and drugs. Reinterpret the current concept of favelas inside a vertical city; control and plan the unmeasured growth of these settlements; provide a better quality of life for the inhabitants of favelas or of any similar informal settlement in the world by diminishing the risk of natural disasters, health and insecurity problems, violence and/or drug trafficking, by increasing access to better services and infrastructure and by eliminating existing economic and social contrasts. Besides eliminating the existing contrasts, the main purpose of this project is to help inhabitants of favelas to be familiarized with the building and establish a relationship with it in which its functions and development adapt to the needs of the users, allowing them live in a space where their work, education, and health requirements are met. this project aims to increase the inhabitants’ economy, live up to the standards of any other city in brazil, offer public transportation and become a space where people can live freely and express their views without recurring to violence and/or crime. The space where the favela was located will be reforested and used as a protected natural area. An integral project with a parametric function based on a pattern from the theory of the “cellular automaton” by John Horton Conway in The Game of Life (1970), designed in three dimensions that can be expanded in a dynamic system based on the requirements, needs and number of users. It is a self-sustainable building where climatic factors such as heat, humidity and rain are exploited to diminish the high costs of basic services. Thanks to the percentage of green areas located on the terraces and open spaces, water recollection is possible as well as harvesting produce for consumption or merchandising. The project contemplates spaces for housing, health services, religious ceremonies or cults, public education, museums, forums, theatres and workshops for cultural activities, sport centers with the best equipment and a football stadium with great capacity, public and private offices, as well as large shopping centers, recreation sites, playgrounds and stores equipped with urban furniture. it has all the necessary facilities for energy and water to be stored and distributed for daily use. Water availability in Somalia is naturally climatic issue. With extremely low rainfall and much higher potential evaporation, the country is characterized as water-scarce. Only 30% of Somalis have access to safe water, leading to increased risk of food shortage, social conflict, stress to economic growth, and poor standards of living. A stable supply of clean water can be achieved through implementation of engineering and architectural concepts. A self-sustaining network of aqueducts linking cities will solve issues arising from water scarcity. These aqueducts will supply clean water and create water bodies next to main cities, where water to be used by local families and businesses. Somalia is located next to Indian Ocean, with its salt water not suitable for consumption. The high evaporation rate from the hot climate is a key factor to issue of water scarcity in Somalia, but it can also contribute to its solution. Salt water from the ocean can be evaporated, separating the clean water from salt and other minerals. Sunlight will be used as the main energy supply to evaporate salty water. An aqueduct network consisting of towers will help to clean water as well to produce energy needed for clean water flow. The first and tallest tower to be located at shore of the ocean, close to capital of Somalia city of Muqdisho. The structure of each tower will hold a large trussed ring comprising magnifiers, which direct sunlight onto the front reinforced concrete and insulated wall with iron pipes. Magnifiers being at high level will not be affected by ground dusty winds and will need less maintenance. Each magnifier will be unique as it to direct sunlight to given part of the pipe for continuous heating. The lower end of the pipes will sit in a water compartment where water flows from the ocean. The bulk of light from the magnifiers will need to be directed to the lower ends of the pipes to achieve the highest temperature for water heating and evaporation. Evaporated water will pass through turbine generators to produce energy. Vapor free of salt to reach uppermost of tower where it will be cooled to liquid state by strong winds above the surface layer common for Somalia. 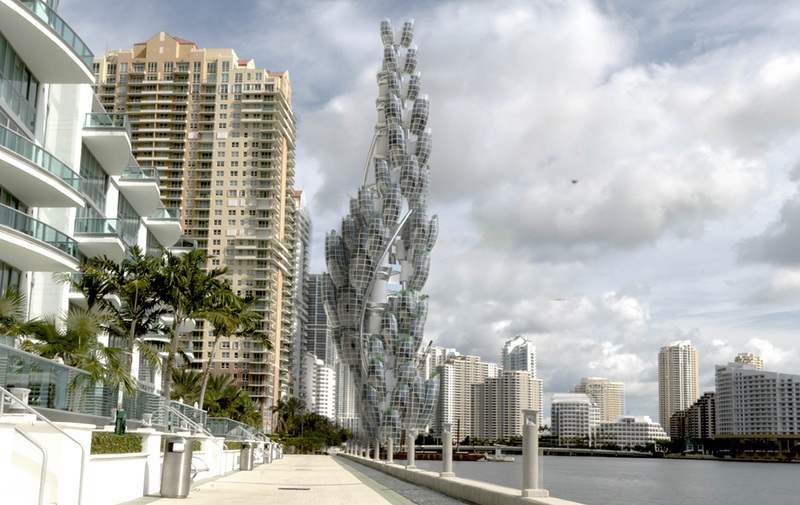 The cooling part of tower will be incorporated with turbines to produce energy. Cooled water will be treated with necessary minerals will flow by gravity down to aqueduct network, passing though generators producing energy. Energy from the three types of generators will be stored and used for pumping clean water at aqueducts due to difference of ground levels. Aqueduct to transport clean water from Muqdisho Tower to next city of Afgooye, where it will be stored as artificial water body. 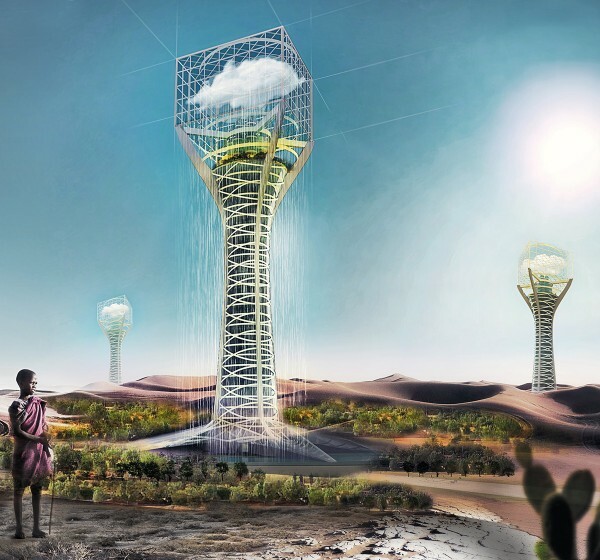 The Afgooye Tower will use same concept as the Muqdisho Tower to clean water of dirt and dust and to produce enough energy to transport the water through an aqueduct to the next tower. The last tower to be city of Xuddur which is the most affected by water scarcity.